In our Designing for Place series, we discussed that precise location data can provide richer insights into your users’ behavior and interest. Those insights can help you decide the best places to build experiences that reduce friction between the user opening the app and getting value. We call this "appticipation." Having this contextual data on where and when your users are accessing your app and its functionalities can help you to design your app to become vital to the daily life of your users, with the end goal of delivering personalized app experiences to each of them. The usage analysis we outlined in previous posts can help give you a better understanding of your app usage and functionality: now, we'll take those findings and see how cooking and recipe apps can apply appticipation to better understand what functionality users favor and use in the places they are in. Some recipe apps today like iFood or AllRecipes use location with a “stores near you” feature, where you can see where the closest grocery store is to your location. 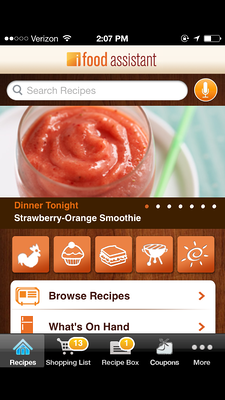 The home screen of many recipe apps displays the recipes of the day and encourages users to search for recipes with a search bar. The menu may also provide users with additional options like a shopping list or a favorite recipes list. We can’t help ourselves when it comes to imagining what the next version of recipe apps might look like with appticipation. To make the process more fluid, we would recommend using location-based context to personalize recipe recommendations and to offer modes like “Planning Mode”, “Shopping Mode” and “Cooking Mode”. Recipe apps can offer a “Planning Mode” to help users plan their meals around their personal lives and the kind of food that they like. Incorporating personas enables the app to know the user’s interests, behaviors, eating habits and intents. This level of anonymous detail on users’ behavior results in a better, more personalized experience for each user. College Students may not have a ton of experience cooking yet because they are living on their own for the first time. A “College Student” Persona is served basic, beginner recipes with a small number of easy to find and cheap ingredients. “Fitness Enthusiasts” will get lower calorie, healthy-ingredient type recipes. Planning meals can change based on if a user is home versus traveling. With precise location-based context, the app can know this information and assume that when the user is traveling they have fewer ingredients, storage space and not as much time to prep and cook a meal. In this case the app can provide suggestions for meals that have less ingredients and less prep time. The app can also add local flavor when it knows the user is traveling. If they are in New Orleans the app can suggest recipes of local dishes and local ingredients to try. With location technology, the app can know which restaurants the user typically visits, and more specifically, which restaurants they have visited that month, week, and day. This information gives the app insight into what kinds of food the user enjoys and what food the user has consumed already that week. 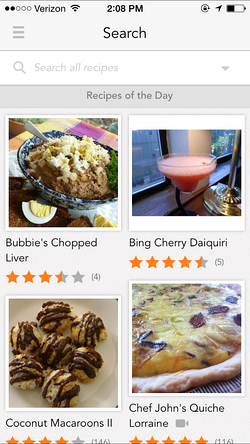 The app can make an educated recipe recommendation based on what kind of food the user enjoys. By using Personas to know who your users are, you can add context to your recipe app to help make their lives easier and your app more vital. With location technology, the app can combine knowing you are home with the appropriate mealtime to know that the user is ready to cook. At this time, the app can give the user the option to turn on “Cooking Mode”. “Cooking Mode” is designed to help the user read the recipes and access all of the ingredient and portion information when cooking. “Cooking Mode” offers bigger text, populates ingredients, steps, and relevant videos to help you cook the recipe efficiently. “Shopping Mode” populates the screen with the user’s shopping list. While the user is in a specific grocery venue, the app could offer any relevant coupons associated with the venue and apply them the items on the users’ shopping list. The app would know the user is in the grocery venue and would prompt the user to “apply this coupon” to the corresponding items. If the user answers yes, the app can provide a suggested menu based on their Persona and past recipes. The app can also ask educated questions based on time. For example, “It is 8PM, have you eaten yet?” If not here is a quick and easy recipe. By having these other modes, recipe apps can add context to their app to anticipate the next moves of their users, to simultaneously help to make their lives easier and their app more vital.